EU leaders are meeting today in Brussels to discuss the EU’s 2030 energy, environment and climate change framework which will likely involve some new targets for emissions reduction. You can find our full thoughts on the original Commission proposal here – but broadly we think that the more flexible structure is a good approach and that dropping the binding renewables target is the right approach. 1. A global deal – Without this the net benefits of the EU’s approach fall from over €200bn to between -€11.4bn and -€20.6bn. 2. Emissions targets will lead to lower emissions – while the UK’s domestic carbon emissions have stabilised or even fallen slightly, its overall consumption of carbon has risen (save for a drop during the financial crisis). 3. 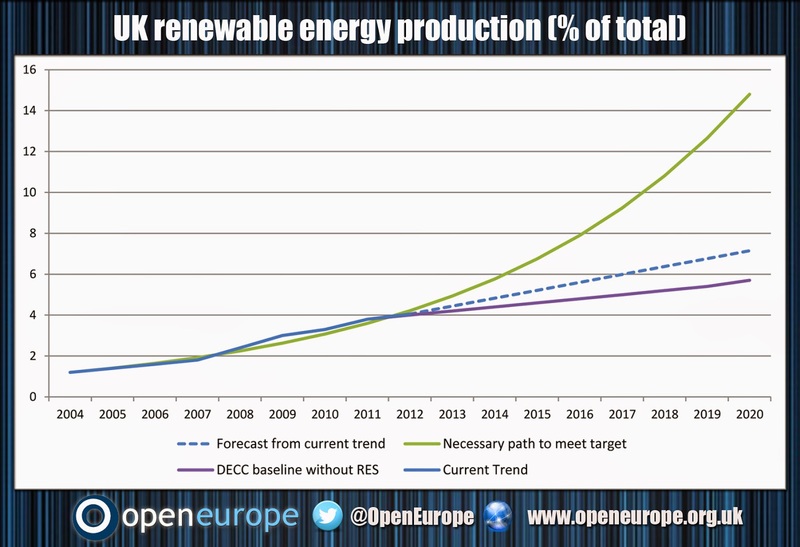 UK’s targets are achievable – Recent simulations for the European Commission suggest the UK will fall 4% short of its target of 15% of energy from renewable sources by 2020. 4. Technological developments will cut cost of renewables – renewable energy remains, for the large part, reliant on subsidies and unable to compete with fossil fuels on the open market. 5. UK’s energy security will increase – far from increasing, the UK’s energy future looks more uncertain than ever, with talk of blackouts now commonplace in the media. The renewables target is exacerbating the coming energy crunch. Given the intermittent and unpredictable nature of many renewable sources close to 50% of the UK’s generation capacity will need to be from renewables. 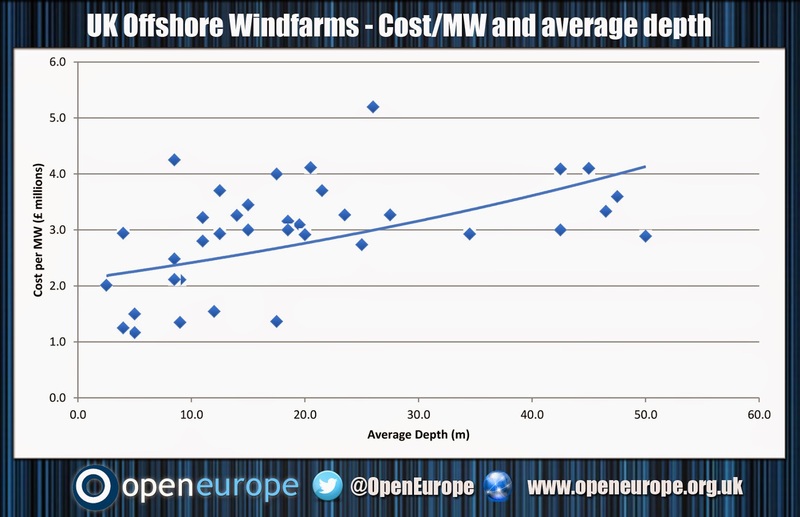 The only real option is offshore wind. However, given the size of fields needed they will need to continually move into deeper, rougher water. The available data suggest a clear correlation between deeper water and higher costs. Therefore, while the likely removal of the renewables and other binding targets from 2020 to 2030 is welcome, we believe it will not be sufficient. In particular we highlight that the current policies are having a significant impact on bills. 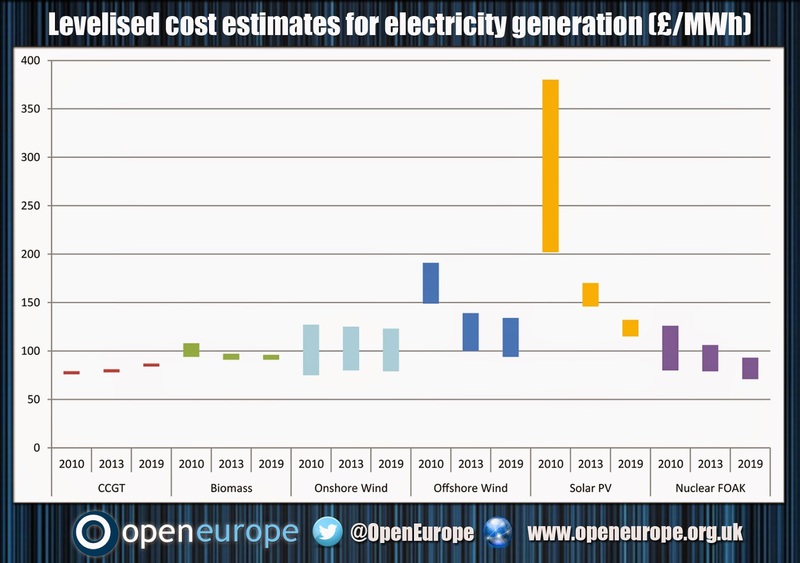 Open Europe estimates that, in 2013, the average household’s dual gas and electricity bill was increased by £59 (5%) due to EU regulations or UK implementation of EU defined targets. By 2020, EU-related regulations or targets will increase annual household bills by £149 (11%). The impact on medium sized businesses is particularly troubling as shown in the graph below. Open Europe estimates that in 2013 the average medium sized business bill was increased by 9% (£130,000) due to EU regulations or UK implementation of EU defined targets. 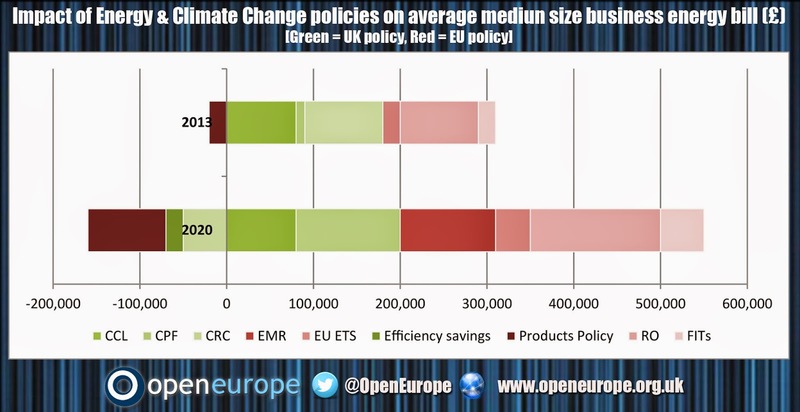 By 2020, EU-related regulations or targets will increase medium sized firms’ bills by 23% (£350,000). With these figures there are some caveats: DECC claims that there are sufficient offsetting policies which will reduce these costs, however, it’s not clear why these cannot exit in any case (i.e. why bills could not be even lower on net) and that even if these policies were changed, the costs may not evaporate entirely. Lastly, in terms of the overall picture these policies have proven to be costly but with limited benefit, while many countries, including the UK, look off track. Therefore, we recommend an urgent reassessment of the current policy along with the 2030 framework. After all, if there is a move away from a binding renewables target after 2020, logically it seems strange for governments and businesses in the UK to make huge investments just to meet the current target which will soon be obsolete. A crucial part of EU reform will creating more flexible policies which can adjust to changing circumstance, which involve continuous, rigorous economic assessment and where mistakes can be undone. This seems as good a place to start as any.